How served: 22oz bomber poured into Dogfish Head snifter. I paired this beer with: Grilled chicken marinated with lemon butter marinated. There is a split decision on this pairing, the wife says that the flavors of the marinate and the finish of the beer clash & I say the pairing went well, could have been better, but still acceptable. Tasted on: Tuesday June 22nd, 2010. Note: The beer poured with a fluffy one finger head and left a small thin lacing on the glass. The initial smell was sweet almost honey like, then I picked up some citrus/grapefruit. The initial taste of this beer was mildly sweet from the malts, and then it finished with mild bitterness of grapefruits. Nothing over the top here, just a very well balanced beer. It was much less “hoppy” then expected from a Imperial IPA, but not disappointed due to the excellent balance of this beer. The mouthfeel was just a tad under a thin syrup and had a very nice carbonation level for this style of beer. I would definitely drink this one again in the summer, fall, winter or spring. I would have this beer with brunch, lunch, dinner or just by itself. 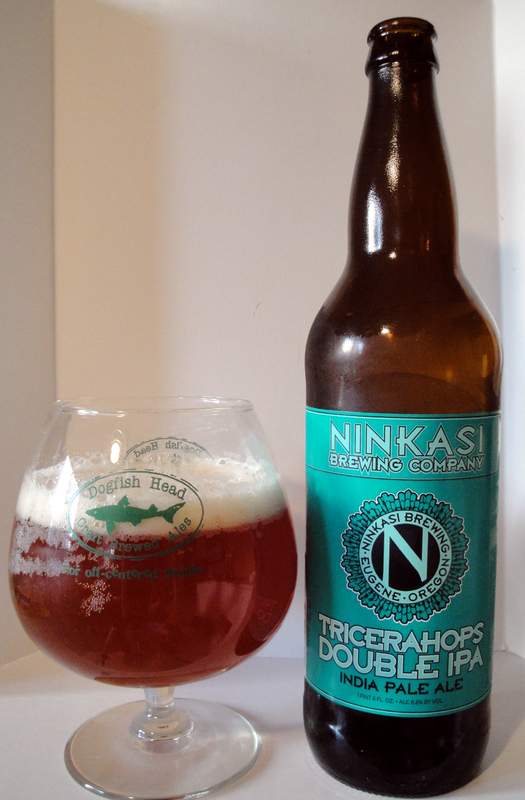 On the Label: Tricerahops is double everything you already love in an IPA. More hops, more malt body and a higher gravity define this Double India Pale Ale. Fiercely flavorful, guaranteed to satisfy. The ancient Sumerians worshipped the beer they made, praised the Goddess Ninkasi for the miracle of fermentation. Beer is a staple of civilization. Worship the Goddess. Hops, hops and more hops, combine with enough malt to make this a very balanced 8.8% beer. Floral and smooth, dry hopped for aroma, an outstanding Double IPA. 8.8%alc./vol. 100+ ibus. Always available in 22 oz bottles, and on draft. How served: 750 ml bottle poured into a Rochefort goblet. I paired this beer with: Chipotle and cherry marinated wild salmon which was grilled. This was a very nice pairing as this fish with its woodsy flavor match up with the sweetness & mild bitterness of this brew. Tasted on: Friday June 18th, 2010. Note: The beer poured with a nice 2 finger head which dissipated rapidly and left a thin lacing on the glass. The nose was floral and citrusy leaning more towards orange. The taste started with the expected sweetness from a Belgian style triple with the citrus and spice notes. You get a mild piney bitterness which help balance the sweetness of this ale from those “American hops”. The mouthfeel was dry, thin and refreshing with a nice level of carbonation in this extremely drinkable brew. 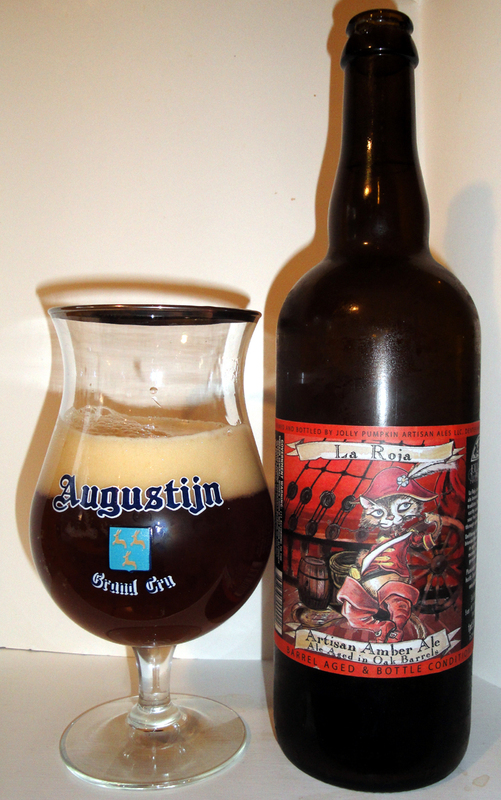 Be careful as it is 10%abv, which you will not notice until you are done with the bottle. 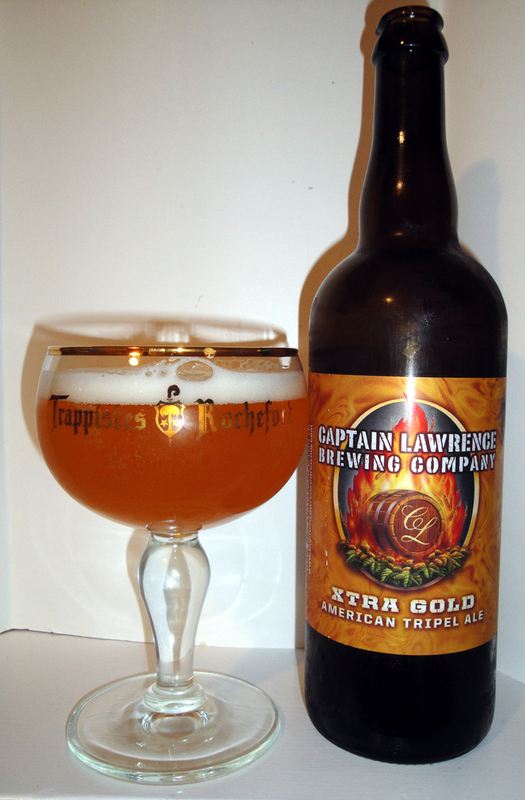 Captain Lawrence suggested drinking this out of a goblet. I did, but since I always enjoy my triples in tulips, I had my second glass out of a La Chouffe tulip. I thought the presentation & the nose where superior when it was in the tulip glass. The taste, maybe it was more psychological, also tasted much better in the tulip. I say go with a TULIP GLASS instead. Now which one looks better to you? The one on the left in the LaChouffe Tulip or the top photo in the Rochefort Chalise? I would say the Tulip, would you agree? Now the better looking glass is up to debate, but I’m talking about the look of this beer. On their Website: This beer is the result of the marriage between two very distinct beer styles; the Belgian Tripel & American IPA. We have taken the best qualities from both styles and allowed them to shine through. The fruity and spicy notes from the imported Belgian yeast strain & the pungent flavors and aromas of the American grown Amarillo hops flow seamlessly together to create this flavorful ale. Straight from the Captain’s cellar to yours, we hope you enjoy. SENSORY PROFILE: Enjoy in a goblet or wine glass. Tropical fruit and honey are the two biggest aromas coming from this lively brew. While the hop bitterness is not as powerful as an IPA, the hop flavor melds nicely with the fruity flavors created by the imported Belgian yeast strain used. 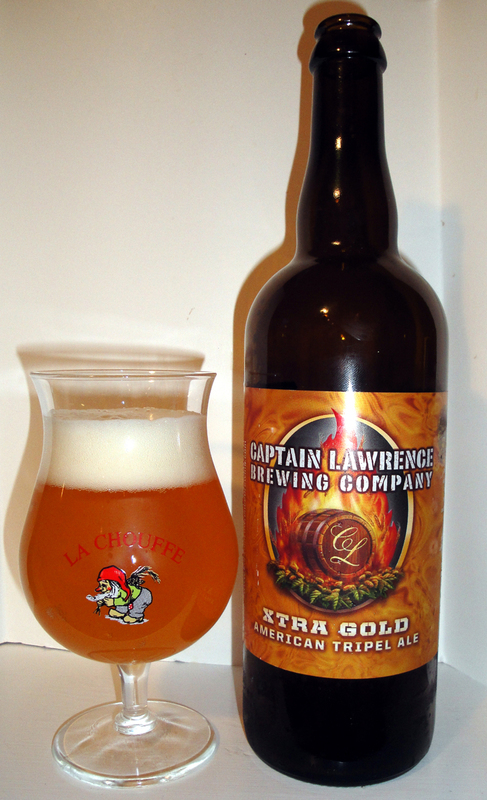 FOOD PAIRING: This beer goes great with roasted vegetables, fish and rotisserie chicken. And it can be used as a aperitif before dinner with shrimp cocktail. 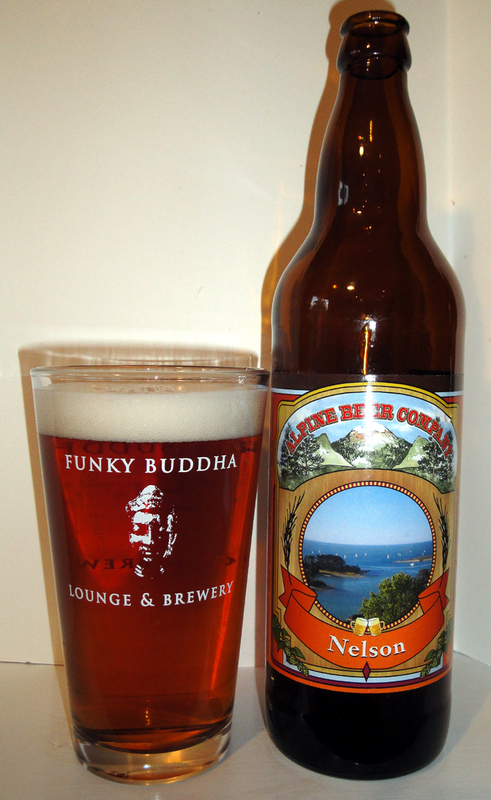 How served: 22 oz bomber poured into a Funky Buddha Lounge & Brewery pint glass. I paired this beer with: Shrimp grilled with a spicy “chicken wing” marinade then sprinkled with a “secret” spicy seasoning salt. Yummy!! I would do this pairing again. Tasted on: Monday June 14th, 2010. Note: As soon as you open up this bottle you get a whiff of citrus which keeps improving as it is poured into the glass. As you taste this IPA you get a nice mildly bitter grapefruit taste followed by some mild sweetness from the rye which really balances this brew. The Mouthfeel is light with mild carbonation, and the drinkability was exceptional. This is a great everyday brew, especially on hot Florida days/nights and for pairing with spicy foods. If you are looking for something with a bit more of a hop kick you should try out Alpines “other” hoppy brews, such as Double (Imperial) I.P.A Pure Hoppiness http://wp.me/pEFaj-al or if you dare their Triple IPA Exponential Hoppiness http://wp.me/pEFaj-ai. On the Label: This golden IPA has the addition of rye to enhance the flavor profile and gives it that “something special.’ We use Nelson Sauvin hops from New Zealand, prized for their white wine, fruity flavor. The scent of fresh grapefruit greets you each time you lift your glass. DRNK ALPINE ALE or GO TO BED! On their Website: Seasonal Beers- beers we brew as often as we can, but not all the time. Brewery: Mikkeller website This was Brewed at Nøgne Ø, Grimstad, Norway. How served: 500ml capped bottle poured into a La Chouffe glass. I paired this beer with: Nothing, had it as an after dinner drink, but would have been perfect for brunch too! Tasted on: Saturday June 12th, 2010. Note: So I’m going to be tasting a beer made with weasel poop. Well not really the poop, but the coffee beans which were pooped out. Just hoping that the beans were cleaned 1st. The beer pours very thick and dark (maybe the beans weren’t cleaned 1st) leaving a thin dark tan head. The nose was all espresso and dark chocolate. The taste was of dark roasted coffee and dark chocolate and only a hint of the 10.9% abv. The mouth feel was thick, smooth and rich. On the Label: This imperial Oatmeal stout is brewed with one of the world’s most expensive coffees, made from droppings of weasel-like civet cats. The fussy Southeast Asian animals only eat the best and ripest coffee berries. Enzymes in their digestive system help to break down the bean. Workers collect the bean-containing droppings for Civet or Weasel Coffee. The exceedingly rare Civet Coffee has a strong taste and an even stronger aroma. 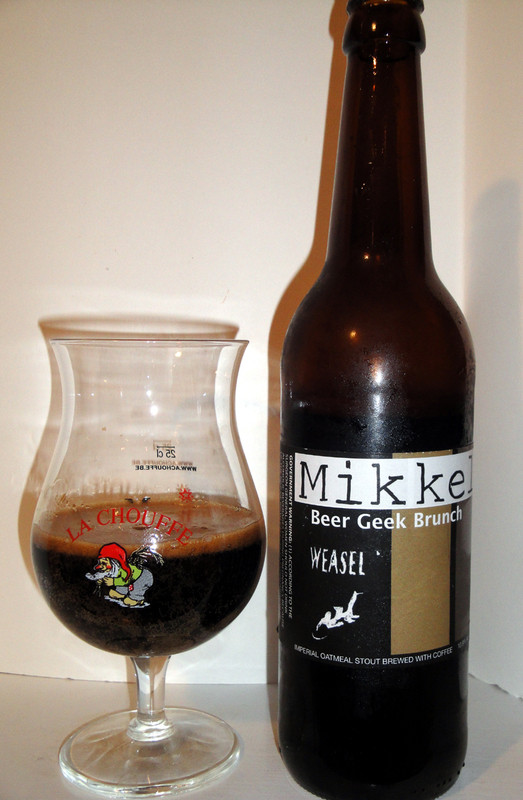 Brewed & Bottled By Mikkeller at Nøgne Ø, Grimstad, Norway. On their Website: Brewed at Nøgne Ø, Grimstad, Norge. This imperial Oatmeal stout is brewed with one of the world’s most expensive coffees, made from droppings of weasel-like civet cats. The fussy Southeast Asian animals only eat the best and ripest coffee berries. Enzymes in their digestive system help to break down the bean. Workers collect the bean-containing droppings for Civet or Weasel Coffee. The exceedingly rare Civet Coffee has a strong taste and an even stronger aroma. How served: 500ml capped bottle poured into a St. Louis Premium glass. Note: This beer was brew once. It is Batch # 246 with a total of 2160 bottles & bottled on Nov 24, 2009. This beer poured with a very large head, even with a slow pour to keep it under control. The head did dissipate quickly leaving a nice lacing on the glass. The nose was nothing to brag about, maybe some light smoke, mild funk and a hint of cranberries. The taste was all smoke to me, I couldn’t get any of the cranberry or currant taste, maybe I just have some weak taste buds. I felt like I was drinking a Rauchbier instead of a Wild Ale. This brew was neither sour, tart nor sweet if that is possible. I think this beer would be great to use as a marinade. It was drinkable, but not something I would look for in the future. This is the 1st brew I’ve had from HaandBryggeriet which has disappointed me. On the Label: The Haand brewers- four guys making beer in their spare time, on an absurdly small scale- specialize in recreating old Norwegian farm beers. Here’s one made with a variety of different grains, and some typical fruits from the region, handpicked by the brewers. It is fermented by airbourne wild yeast, unfiltered, and unpasteurized. 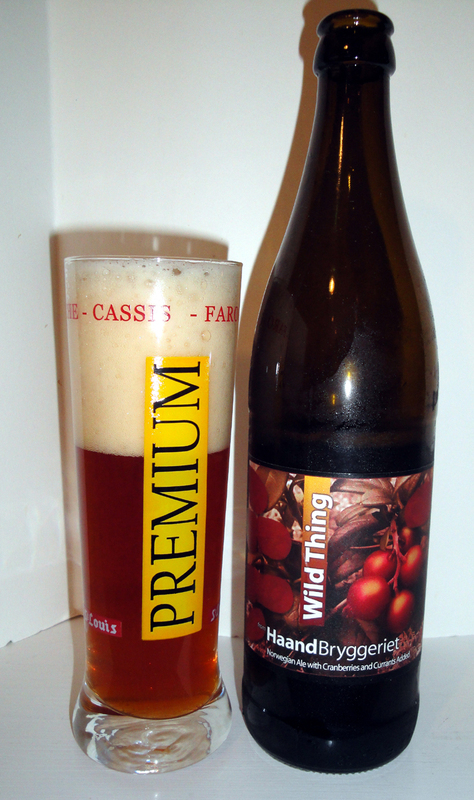 Wild Thing, you make everything…groovy. Tasted on: Friday June 11th, 2010. Note: This is Batch 04×4. This bottle opened with a champagne like “pop”. It poured with a small fluffy head on my slow pour to avoid any yeast on my 1st glass of this beer. The nose was slightly funky with some sour cherries. The taste was well… amazing. You first get hit with a mild puckering tartness followed with delicious sour cherries, and then I picked up some oak and maybe a tad of the pinot. As for the Brown Ale, well I couldn’t tell what the base beer was if I wasn’t told. This beer is extremely refreshing for a tart/sour beer and the mouth feel was well… mixed with a tongue twisting tartness and had a massaging action from the medium level of carbonation. I am a huge fan of Lambics, Gueuze and Wild Ales and Supplication is, if not the top, very close to the top of my list of all time favorites in those styles. This brew should age very well over the next 3-5 years, so I’m glad I have a few more bottles. 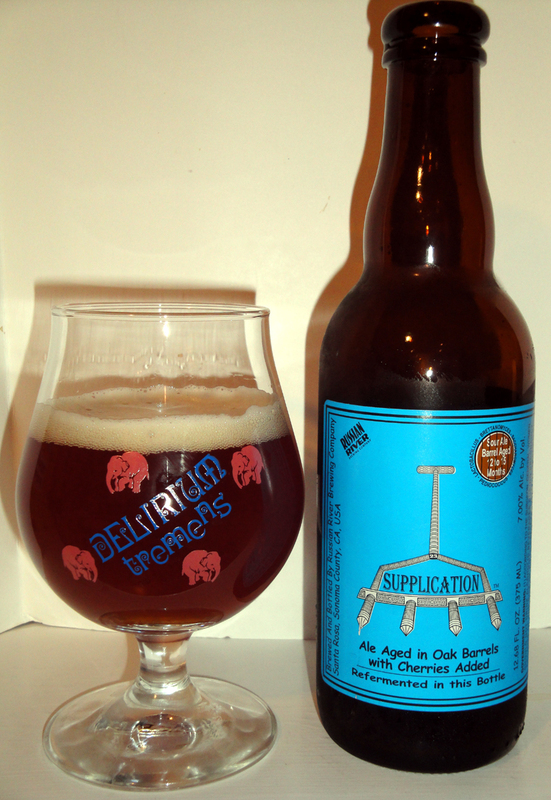 On the Label: Supplication, sup·pl·ca·tion, n 1. To ask for humbly or earnestly, as by praying. 2. To make a humble entreaty to; beseech. The beer inside this bottle took more than a year to make- a reasonable length of time for a fine wine, but not for beer. This is, in fact, a brown ale aged in used pinot noir wine barrels. During the barrel aging, sour cherries, Brettanomyces, Lactobacillus, and Pediococcus were added to each barrel, imparting a nice cherry flavor and sourness. While most winemakers and brewers cringe at the idea of adding Brett and bacteria to their wine or beer, our brewer Vinnie Cilurzo embraces these unusual ingredients in beer, despite his winemaking background. Ironically, Vinnie decided his winemaking days were through when he discovered it takes just twenty-one days to make beer. Years later, it takes him over a year to make this beer! Supplication is refermented in this bottle to create its carbonation – a process commonly used to make fine Champagne and sparkling wine. Spent yeast forms a thin layer of sediment in the bottle, adding yet another layer of complexity and flavors. Pour slowly as to allow the natural yeast sediment to remain in the bottle. From their website: Supplication: Brown Ale aged in French oak Pinot Noir barrels with three strains of Brettanomyces, Lactobacillus, Pediococcus and sour cherries .